Made from an actual once fired 30-06 cartridge. The .30-06 Springfield rifle cartridge gets its name as the .30 cartridge introduced and standardized by the U.S. military in 1906. The .30-06 remained the ARMY's primary rifle cartridge for nearly 50 years until it was replaced 7.62 x 51mm NATO (.308 Winchester) and the 5.56 x 45mm (.223 Remington). It remains a very popular sporting round and is made by all of the major ammunition manufacturers. 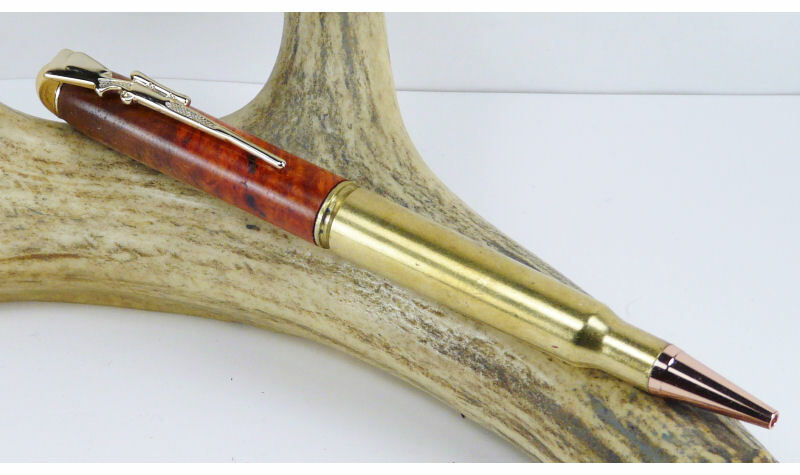 All of the cartridges used to make our pens are once fired rounds.